Our well equipped Studio II can accomodate up to 8 people. Set in rural countryside surroundings with our shop on hand for any supplies you may require. StudioII Time can be booked from 9am to 5pm Wednesday to Friday. Please phone to book a place on 01268 560314, bookings must be made at least 24 hours in advance. Bench space - Bench space can be hired for £4.00 per person per hour and includes use of the grinder, Unsupervised, with previous experience required. Studio Hire - Why not get together with some friends (maximum 8) and hire the whole studio for your group. £24 per hour or £150.00 for the day, includes use of the grinder. Sandblaster Hire - £6.00 per 15 minutes or £20.00 per hour. Sandblasting can be used to add extra special effects to your glass, giving an etched finish. You can also etch selective parts of your glass work, remove iridescent coatings, or use to remove kiln wash or fibre paper that has stuck to the glass during fusing. Our sandblaster uses white aluminium oxide 180-220 grit, is fully air pressure controllable and is set in a specially designed, self contained booth. It can take pieces up to 80cm x 50cm. Quick and easy to use, your first session will include a 5 minute induction on the safe and correct use of the sandblaster. Wet Belt Sander - £15 per 30 minutes or £25 per hour.The wet belt sander is one of the best tools for giving your glass that professional finish. Use to straighten edges, create bevelled edges and polish your work. A variety of different grit belts provided, including a cork belt for a high polished finish. Before first use you will need to attend a 20 minute induction on the safe and correct use of the equipment at a one off cost of £5. Revolution XT Ring Saw - £15 per 30 minutes or £25 per hour. The XT Saw is one of the best tools for cutting straight lines or curves with precision The saw cuts forwards and backwards with the double sided blade making curves simple. Use to straighten edges, create bevelled edges, cut pattern bars and more. Endless width and length size capability, cuts up to 60mm thick. 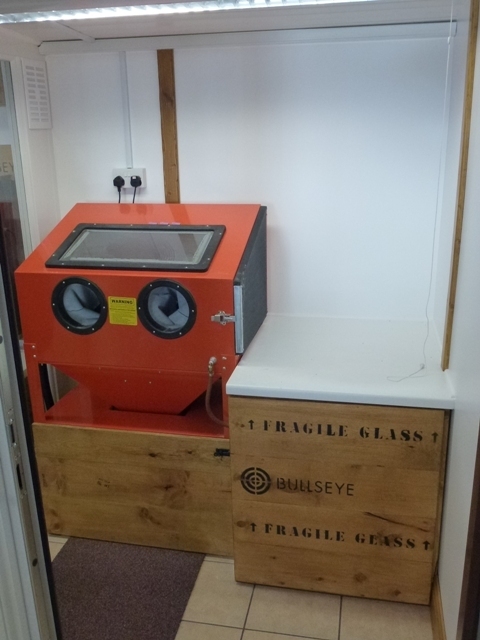 Kiln Hire - includes a primed shelf and thinfire paper if required. Hobbyfuser £10 per firing - shelf size 38cm square. FK5 £40 per firing - bed size 90cm x 90cm - hire includes primed shelves and thinfire paper if required.